Welcome to the Quietfire Design's 2017 Queen of Hearts Blog Hop! This week we're celebrating the release of the newest dies, stencils and stamps from Quietfire Design by sharing our best projects! Now Suzanne has also started a stencil line and I'm using the "Flourished Frame" loving it. You can get them at Elizabeth Craft Designs or HERE on Quietfire Design. What would a celebration be without a giveaway!? Suzanne is giving away stamps, dies or stencils to random winners on each blog. Make sure you leave a comment below before midnight Sunday February 19, 2017. A winner will be randomly chosen from my list of comments and the winner's name will be posted on Quietfire Creations shortly afterwards. Visit and leave comments on all the designers Queen of Hearts blog posts! You can go back if you've missed any of them. Beautiful card and a lovely design! It's gorgeous Yogi, such a lot of beautiful elements. I knew your card would be extra special, and you didn't disappoint! Gorgeous! Your side easel card is lovely with great colours. I also enjoy doing these kinds of cards. Fantastic easel card! Sure to bring a huge smile to whoever gets it! Thanks for joining our weekly QKR Stampede challenge! Love the dies and stencil. Thank you for joining in the QKR Stampede challenge. Wow....wonderful dramatic card!! Beautiful details! You did it again Yogi! Beautiful card! Beautiful card! Love the elegant font of the word dies! Beautiful details and color combo! I love the way you have combined several diverse elements to make a beautifully understated card. The diffuse coloring just adds to the overall effect. And you can't beat the sentiment. I love it! Beautiful card Yogi, I love your rainbow coloured die cuts! Very special birthday card. I like the butterflies. So many beautiful elements - dies, stamps, stencils, making a gorgeous card. What great elements and design features in this card. I haven't made a side easel card for a while. Thanks for the inspiration to get one done for my own collection. TFS you always have something different and special to bring to the table. Your frame is a stencil? It's so beautiful! Another cool easel design that really shows off all the good stuff. Thanks for the measurements, too, Yogi! What a cool and elegant stand-up card! Love the birthday card, Yogi! I am a big fan of die cuts, and the way you used them on the top of your card looks really good!!! I love the design of your card, and the sentiment as a "stopper"! Its a beauty, for sure!!! As usual you have created a beauty. Love how the Birthday pops off the edge. LOVE this card! The colors, the design, the words! As usual - no surprises here, you have a wonderful eye for all of the above. Thank you! What a fancy fold, and wonderful use of all those die cut words. I always love the beautiful fonts by Quietfire Designs. This is a great easel card - not sure I have seen this type before. 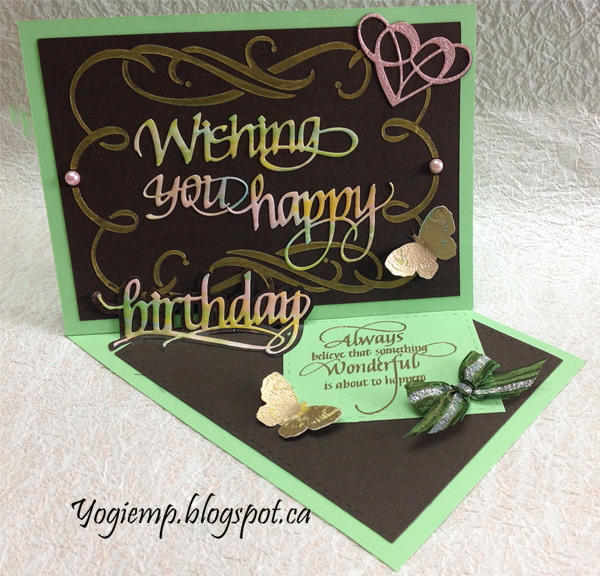 Your birthday easel card is stunning! I love the way you colored the words and the pretty little butterfly you added. Such a pretty card using one of your fave products. Thanks for joining us this week at Little Red Wagon. Great treatment on the text. The colors were really nice. Haven't seen a card quite like this before. Great greeting indeed, love the ombré colouring well done !!! The swirls really set for the layout brilliantly. What a gorgeous card! Great design! Someone will have a happy birthday! Gorgeous card. I love these twisted easel cards and still haven't tried one yet! Great job on it. I really love the ombre look to your word! Awesome. Wonderful, Yogi! Love the cocoa and lime together. Great card! Love the color combination. It would work for a man or woman. I plan on using this idea. I so enjoy making side/twisted easels so I was immediately drawn to your card...the colors and the die cuts work well together. Definitely a keeper! I love everything about this card! Beautiful! Great card. The colourful dies stand out so nicely against the dark cardstock. Wowza Yogi, you make the most amazing, beautiful cards, especially the easel ones. I can't seem to do more than super simple easel cards, so I don't do them. 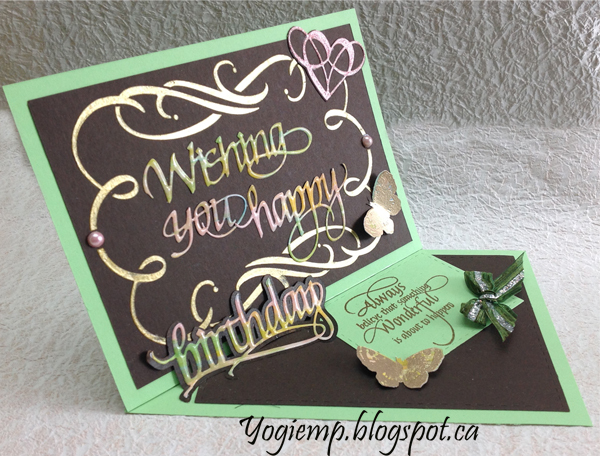 I love the easel card but your use of the dies and the colors are outstanding! I just love the design and colors! Beautiful! So happy I found your blog! This is so gorgeous!! The colors of the words are amazing!! I love the design and the pretty butterflies!! What a beautiful card!! Thanks so much for playing along at Scrapy Land! !